Toyo Restaurants specializes in Teppanyaki cuisine, a traditional Japanese cooking style performed on large iron griddles called teppan. Our downtown location also serves fresh and mouth-watering sushi. 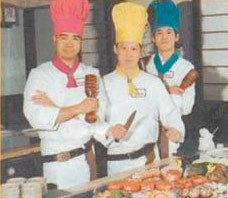 Since 1981, Toyo Restaurants has not only offered their clients a gastronomical experience but a theatrical one as well. Using only the freshest and finest ingredients, one of our skilled and charismatic chefs will prepare your meal right before your eyes on a teppanyaki table. You may enjoy flambeed shellfish, fresh sauteed vegetables, delicious terriyaki chicken and our succulent cuts of beef while watching the spectacular show put on by our chefs. To compliment your wonderful meal, you may savor a great selection of wine, exotic Japanese cocktails of Japanese beer. Whether you are looking for a family dinner, a place to host your corporate event or a restaurant to celebrate a special occasion Toyo has the right atmosphere and cuisine to make your experience memorable.